Cadaba (Cadaba farinosa Forssk.) is an evergreen shrub found in Africa that is mostly used as a browse for livestock. Fruits are edible and were referred to as famine food (UN-EUE, 2001). 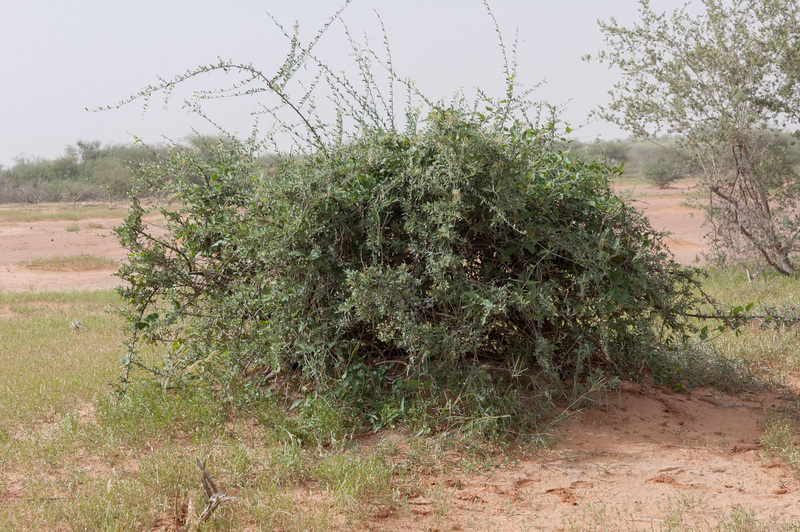 Cadaba farinosa is an evergreen tangled shrub, growing to a height of 5-8 m. Cadaba has many arching branches covered with smooth brown-reddish bark. Young twigs bear hairs or sessile scales. The leaves are alternate when young, clustered when they get older, simple. Leaf-blade is oblong or ellipitic in shape, rounded at the extremities, very variable in size (5-50 mm long x 3-30 mm broad), greyish in colour. The flowers may be clustered in small apical, flat-topped grapes, or solitary. Flowers are tetramerous, petals are linear, 12 mm long, creamy yellow to pale pink in colour, quickly caducous. Cadaba fruits are orange in colour, cylindrical, dehiscent capsules, 4 cm long x 4 mm in diameter, slightly constricted around the numerous seeds. Seeds are kidney shaped, 2.5-3 mm in diameter, embedded in a red or orange flesh (El-Kamali et al., 2013; Orwa et al., 2009). Cadaba farinosa is a multipurpose shrub. It is mostly used as a browse species relished by all classes of livestock but has numerous uses for human food. The leaves are used to flavour and spice dishes, and to flavour "Kunu", a cereal-based beverage (El-Kamali et al., 2013). Twigs and seeds are used for the starch liquefaction that occurs in the manufacture of Kunu beverage (Nkengbeza et al., 2012). In Konso language, cadaba fruits are called "herd's boy fruit" since young herders enjoy eating them while they are looking after animals. Cadaba fruits are considered a famine food in Ethiopia during severe food shortage as they can mitigate crisis (UN-EUE, 2001). Cadaba wood is used to make traditional stools in Kenya. It is a good firewood. The bark is useful for ropes and the twigs for toothbrushes. Cadaba roots infused with moringa leaves were reported to provide ethnomedicinal treatment of trypanosomiasis. The crushed leaves mixed with millet flour were used to treat coughs (Orwa et al., 2009; UN-EUE, 2001). Leaves extracts are widely used to induce and stimulate the milk production of women in Africa, particularly in Burkina Faso (Lompo-Ouedraogo, 2003). Cadaba has spiritual uses in the Sudan. It can help reducing soil erosion as it protects from wind and water erosion; it is thus used in sand dune stabilization. It is valued for making fences to livestock and it provides shade to small animals such as sheep and goats, or poultry (Orwa et al., 2009). Cadaba farinosa is native to Africa and India. It is widespread from West to East Africa in Senegal, Nigeria, Niger, Burkina Faso, Cameroon, Uganda, Democratic Republic of Congo, Kenya, Somalia, and northwards to Sudan, Egypt, and Saudi Arabia. 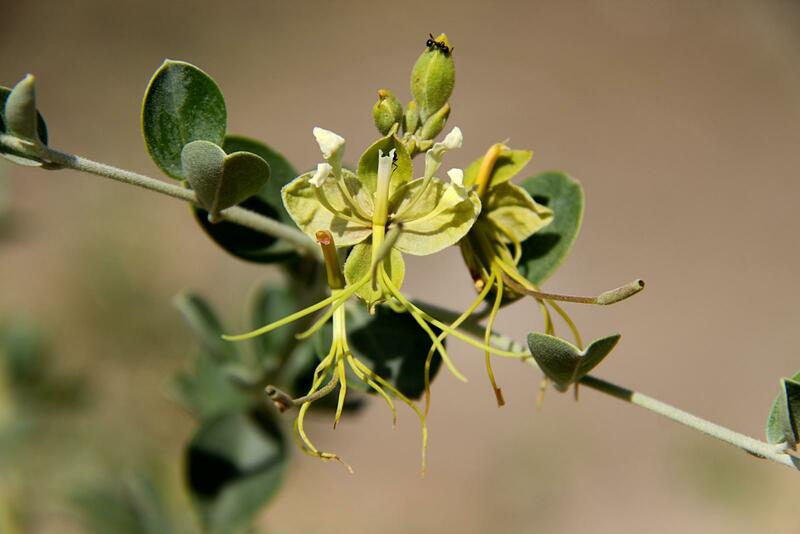 Cadaba grows in semi-arid and arid areas in the desert grass-bush zone (Orwa et al., 2009). Cadaba is found from sea level up to an altitude of 1700 m in places where annual rainfall ranges between 200 and 500 mm (El-Kamali et al., 2013). Cadaba does better on heavy soils but can also be found on sandy, stony slopes or along frequently flooded depressions, around temporary ponds. Cadaba often grows on termites mounds in association with Balanites aegyptiaca and Maerua spp. (El-Kamali et al., 2013; Orwa et al., 2009). Cadaba propagates naturally by seeds. Flowering occurs at the end of the dry season or at the onset of rains (El-Kamali et al., 2013). Cadaba farinosa foliage has an extremely variable composition. Protein content may vary widely, from less than 10% DM to more than 30% DM. Likewise the crude fibre content may vary from less than 8% DM to more than 30% DM. Ash content may be extremely high, up to 20% and more. Indeed, leaves may show an unusual pattern, with a high protein level (> 20%), a low fibre content (crude fibre < 10% ) and a large mineral content. 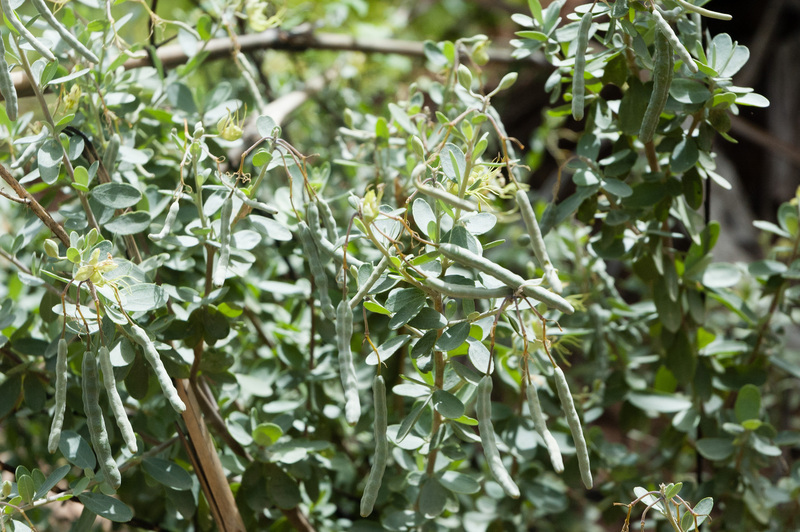 In Northern Ethiopia, cadaba browse ranked third for protein content (above 16% in the rainy season and above 14% in the dry season) and contained consistently lower fibre than other browses such as Maerua angolensis, Capparis tomentosa, Dichrostachys cinerea, and Acacia etbaica. The fibre content was very variable depending on the season of harvest, being the lowest during the long rainy season and the highest during the dry season (Yayneshet et al., 2009). A broad range of phytochemicals such as alkaloids, flavonoids, terpenoids and anthraquinones were found present in cadaba plant material (Al-Musayeib et al., 2013; Askira et al., 2016). In rats, antioxidant flavonoids compounds were reported to have hepatoprotective activity through their free radical scavenging potential (Telrandhe et al., 2010). These compounds could have anthelmintic, antibacterial and antifungal activity as well (Moglad et al., 2012). However, it was reported that cadaba had only low anthelmintic activity in goats, compared to other species (Mengistu et al., 2017). The total phenolic content of cadaba plants was 174 g/kg GAE (gallic acid equivalent) (Askira et al., 2016). Cadaba is 8-10 times less tanniniferous than other woody species found in the same ecosystem, such as Balanites aegyptiaca or Dichrostachys cinerea (Mengistu et al., 2016). In central Tanzania, cadaba ash content was reported to be high, and selenium content could be toxic (Olsson et al., 1989). Most parts of cadaba (leaves, flowers and fruits) are readily eaten by all classes of livestock at the exception of horses and donkeys (Orwa et al., 2009). Camels are particularly adapted to browse cadaba as they are taller than other livestock, and they are particularly fond of this plant. Wild ruminants and herbivores such as buffaloes, hartebeests, and black rhinos also relish on cadaba (Orwa et al., 2009). 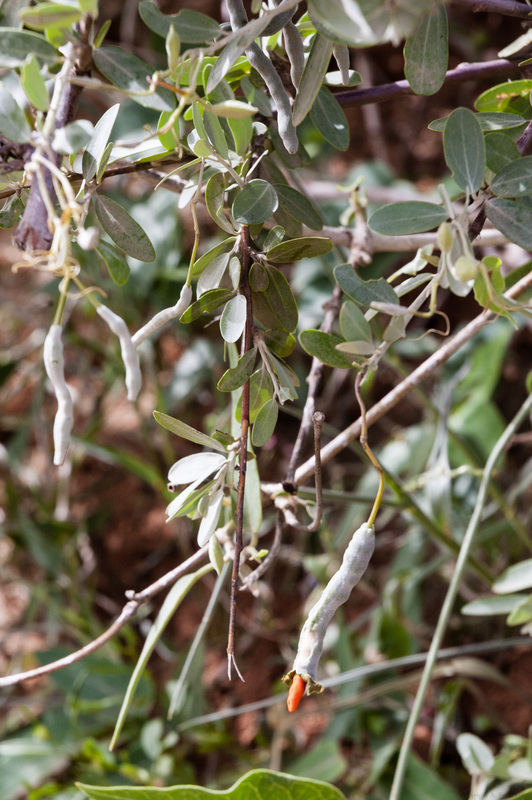 Leaves and young branches of this shrub are used in Ethiopia, Kenya or Tanzania as forage for local ruminants, particularly goats and camels, this utilization being particularly important during the dry season (Dougall et al., 1958; Komwihangilo et al., 1995; Kuria et al., 2005; Yayneshet et al., 2009; Mengistu et al., 2016). In Northern Ethiopia, in vitro DM digestibility of cadaba was 83% with a high estimated metabolizable energy (11.5 MJ/kg) (Yayneshet et al., 2009). These results were in accordance with values obtained earlier in semi-arid areas of Tanzania where in vitro DM digestibility was reported to be 78%. Since the 1950s it has been reported that Fulani herdsmen of the western Sahel prize cadaba leaves for the nutritive value they provide for their cattle during the dry season, especially the minerals and trace elements (Le Houérou, 1980; Dougall et al., 1958). In Uganda, cadaba is one of the most important browse species, and well known by pastoralists of the Karamoja-Sub-region where it holds potential for the improvement of livestock production (Egeru et al., 2015). Goats were reported to browse cadaba on every season (wet or dry). After fallows of 8 to 12 years, cadaba was in the top browsed species by goats and among the most browsed woody species (Acacia etbaica, Balanites aegyptica, Capparis tomentosa, Dichrostachys cinerea, and Ocimum forskolei). Goats spent more time on cadaba, browsed taller plants and had a higher bite rate on this species, thus suggesting its good nutritive value (Yayneshet et al., 2008). However, cadaba was less relished than certain tanniniferous woody species (Balanites aegyptiaca, Dichrostachys cinerea, Rhus natalensis) (Mengistu et al., 2016). Cattle and goats eat the leaves and young branches throughout the year, although not excessively. During the dry season it is often the only source of green palatable roughage (Göhl, 1982). No information seems available in the international literature on the use of cadaba (Cadaba farinosa) in rabbit feeding (July 2017). Since it is widely used for the feeding of many kinds of livestock with no reported issues, cadaba could probably be used safely as forage for rabbits. Nevertheless direct experiments would be welcome before practical recommendation.